When you create a business you are building a management team and within this management team, there needs to be a structure. Giving meaningful job titles to your employees is important because it will give them self-worth and make them want to work harder for your small business, therefore, making your small business more successful. Additionally if the members within the small business work will with each other, this will also create a more productive staff to work under and with the management team. There is a general framework in the business world for creating job titles for your small business from high-level executives to your employees. 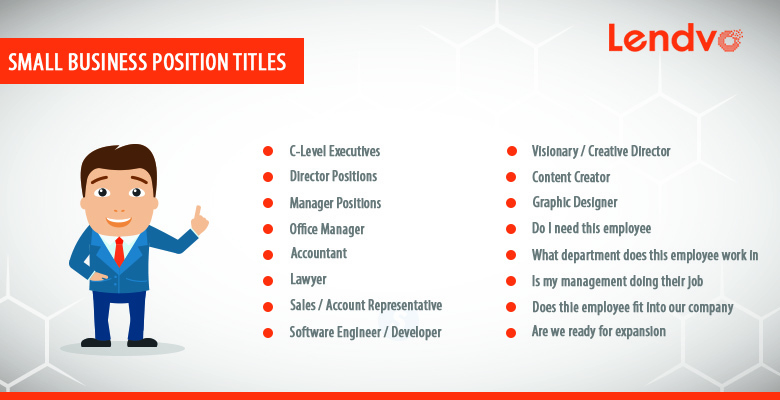 Job titles for your employees can also be beneficial if you are strapped for cash and cannot necessarily give an employee raise, but you can change their title to be one more appealing to them. The truth is job titles could upset some people on a small staff, but at the end of the day you cannot please everyone. Usually, if you are running a small business, there will be a staff of a few people with a lot of responsibilities. Granted, some small businesses are smaller than others and based on the gofcus of a given business, the number of staff members, their responsibilities and the overall organizational structure of the business varies greatly. The role of task management is important and begins with the CEO. It is important that the CEO or the CEO and other C-level owners break down the job titles for his or her employees at the beginning so anyone who leaves the office can clearly explain the tasks to the next employee to come in and handle their position in the future. • CEO: The Chief Executive Officer or a business is always the highest-ranking executive in a company whose main responsibilities including managing all of the operations of the company, including resources. They are the streamline of communication between the board of directors when it comes to making major decisions for the business. The CEO is often on the board, and sometimes the chair of the board. They are also responsible for the strategy of the company, delegating to managers and the future growth of the company. • COO: The Chief Operating Officer is usually the next-in-line to the Chief Executive Officer, typically reporting directly to the CEO about business plans as they relate to the overall business models of the business. The COO is traditionally more focused on short-term goals like Human Resources, strategic planning with specific product lines, while the CEO is focusing on the bigger picture. This person must understand the details of the business, in and out. They are sometimes referred to as the Vice President. • CFO: The CFO is the Chief Financial officer of the business, commonly known as the Controller. All the C-level positions are important, but if this is the one who looks for the money and makes sure the money is being dealt with properly. They do everything from dealing with banks and investors to finding new banks and investors for loans, financing and so forth for new projects and making sure current projects are flush. They are also responsible for overseeing the Accountant when tax season comes around and assuring everything is in order. • CTO: The Chief Technology Officer is the C-level executive in charge of managing the information technology of the company. They are responsible for watching over the technological organization of the business and making sure everything is secure. Additionally, the CTO looks out for new opportunities for the business by keeping an eye on new technology and social trends that may affect them. They must maintain protocol on technology standards, compliance regulation and corporate governance. • CHRO: The Chief Human Resources Officer is usually only a position in larger businesses for the person who is basically the head of operations and who oversees and advises the lower-in-rank HR members. • CMO: The Chief Marketing Officer is usually responsible for overseeing the entire marketing program for larger companies.They deal with brand management, product management, sales strategy and more and more in the digital era, they are involved in the technological aspects of the business. They also help differentiate your product for your competition’s product. • Marketing Director: The Marketing Director is the one in charge of the entire marketing strategy of the business. The Marketing Director deals with the development, implementation and execution of all marketing and promotional material for the business. They also deal with the annual marketing budget and must approve before it gost into play. They are sometimes referred to as the Marketing Manager or Vice President of Marketing. • Director of Operations: The Diretor of Operations is responsible for dealing with employeemanagement and the overall productivity of employees. The DOO also deals with research and development for the business, focusing on analytics, current productivty and looking for ways to improve. • Business Intelligence Director: Business Intelligence Directors must have good strategic ability, communication skills, leadership skills and the ability to deliver effective solutions in a team-driven environment. They deal with all items from analytics to data modeling to the ability to deliver results and communication skills so they cover a wide range of business skills. • Social Media Manager Position: The social media manager position is definitely one you would not have heard of several years ago. The social media manager is a position getting more and more important by the day as this is the person in a business who deals with the analytics, filtering and presence of the business on social media. • Operations Manager: The Operations Manager is responsible for the oversight of the production of goods and services for a business. They deal with multiple departments, including purchasing, warehousing and manufacturing. Their focus is on the happiness of their clients and customers’ based on the quality of product they are receiving. • Product Manager: Product Managers are commonly referred to as the CEO of the product. The Product Manager is responsible cor freating a strategic plan for the product of the business that deals with the marketing, forecasting and Profit & Loss for a product for a particular business. Office Manager: This is the person who handles everything from supplies to incoming phone calls from salespeople and clients to vendors. This employee is responsible for the oversight of the entire production of the office. In certain small businesses, the office manager takes place in marketing duties, word processing duties. There are also Administrative Assistants who help executives or high-level managers with scheduling of appointments, checking emails and keeping things in check. Accountant: The Accountant is essential to most small businesses, although some very small onces are beginning to manage their own finances via QuickBooks or other programs, Accountant’s are still usually very important members to many teams. This individual deals with tracking daily and monthly expense. They usually track monthly income statements as well, create balance sheets, create a list of receivables, manage the payroll and cash for the busines. They are also known as the bookkeeper or controller. Lawyer: A lawyer is a person who may be a part of your business if you run a financial company and need to have an attorney on-hand for compliance issue. A lawyer also will be part of your every day staff if you are running a law firm. Start-ups are additionally finding themselves to be in need of lawyers for the day-to-day seed and money raising stages of their growing businesses to make sure they are doing everything right. Real estate developers are other culprits of attornys on the regular because of their constant and complex deal-making. Sales / Account Representative: A Sales Representative is responsible for being a salesperson for your business and handling the opportunity to increase sales while managing accounts your business already has. Account manager has become a popular name for this team and these employees are important because they are managing the clients who are helping you to bring in your business. Visionary / Creative Director: This sort of position is flexible and usually more common at a company in the enertainment, hospitality, editorial or multimedia space, but their role is to come up with new ideas to better fit and reposition their business into the competitive landscape. They do a lot of research including market research to increase the originality and potential of the business. Content Creator: This position is becoming more commonly seen online as websites and email blasts become more and more important in the marketing world. They deal with user-facing documentation, SEO or Search Engin Optimization, creating content for the emails that are going out including promotional and informational content. They also design tutorial and usage studies.They are responsible for how your image looks from a literal and marketing perspective to your customers and potential customers and this is essential. Graphic Designer: Graphic designers are good employees to have on staff if you are a company in the arts, hospitality, social media, publishing, film, television or any sort of media. These studs are able to combine their artistic talents to create text and pictures known as web design that can be appealing as websites, portfolios, pitch decks and so forth. They can also be valuable freelance assets to have on call if you have any company like one of these or are in the real estate, public relations or finance worlds and need some sort of pitch deck or portfolio created to get a new client or help reign in investors to bring in new business and expand. Do I need this employee? When asking yourself this question, the employee at question on your staff may not necessarily fit into one of the categories above, although they should. They need to be fulfilling important tasks for your business weekly, if not daily. When the employee is completing things your business could not live without and that is what makes them worth staffing and having them on the payroll. What department does this employee work in? If your business is more than five people, it is important to categorize them into a department like those discussed above: marketing, finance, operations, sales, management etc. Is my management doing their job? If you are the CEO of your company and you feel that issues from your staff continue to be thrown your way, this means that your management is not doing their job. The job of the staff members that you put in management positions is to deflect responsibility from going to the C-level executives who are dealing with the overall growth of the business and numerous other problems and hurdles that come with the responsibility of running a business on a daily basis. If you are having this issue, you need to either speak to your managers or have them start giving you weekly or monthly reports to find the root of the problem and if necessary, fire them. Does thie employee fit into our company culture? Every company has their own culture, whether you are a serious law firm, exciting start-up, cut-throat investment bank, restaurant, retail store or social media consulting firm, your company has a culture. Having your employees get alone, at least to the extent that they are not wreaking having in the office, is essentiial and the personality of incoming hires is something you and your partners should consider against the employees that you already have on staff. It is good standard to evaluate your company’s place in the business landscape and consider all the employees you have on staff and whether or not you are ready for expansion. You may have all the regular positions filled and have had a good year financially when you and your partners meet at the end of the year and realize you are ready to expand. This could be a good time to bring on a Marketing or Product Manager, SEO Manager or Content Creator to help draw in new interest to your business and bring in more money the following year. As we mentioned earlier, knowing your employees is important because each employee is or at least should be instrumental to the day-to-day operations of your business and if they are not, that means there is something wrong with your management or the employees themselves. Going over the small business position titles of your employees monthly, or even quarterly can be instrumental in creating position titles that help to continue to propel your business in the future with new hires.